It took until the release of Office 2016 to get the news and it's not good for Business Contact Manager users: BCM will not be updated to work with Outlook 2016. While it's a disappointment, it's not a total surprise as many users wondered how much longer Microsoft would support Business Contact Manager. It had a couple of things going against it: it doesn't generate revenue and it had a small user base. It's very important that Office 365 BCM users do not upgrade to Office 2016. They will also need to block the automatic upgrades to prevent Office 365 subscriptions from automatically upgrading to Office 2016. Businesses using Group Policy can block the automatic updates using the updated Office 2013 group policy template. Look for the option to block updates under Computer Configuration\Administrative Templates\Microsoft Office 2013 (Machine)\Updates. Double click on Enable Automatic Upgrade and choose Disabled, then click Apply and close the dialog. If Outlook is open, close and restart it. 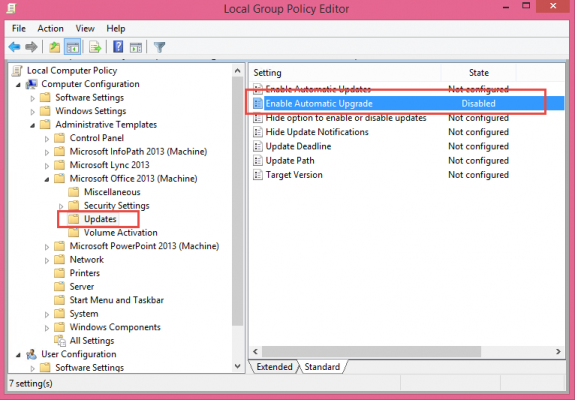 You'll need to close and restart Outlook for values under the policy key to apply. If you don't want to edit the registry yourself, download then run this reg file to set the key. Users who were auto-upgraded to Office 2016 from Office 365 Personal, Home, or University can uninstall Office 2016 and install Office 2013 from their Office account portal. Business subscribers should have time to block the upgrade using the registry key, if not, see Obtaining older versions of Office for the steps necessary to revert to Office 2013. You can customize a contact form to do this, but I would consider using Categories. Is there a way to install BCM in a fresh install of Office Professional Plus 2013? The file here should install just fine - it's the full 368MB file. I have tried that one and the next one to no avail. Seem like either I need Office 2010 or Office 2007+BCM to make either of these 2 work and install BCM over a FRESH copy of Office 2013. If there is no option, do you have a CRM that you recommend? What exactly happened when you tried to install it? You need to use the Nov 14 version of BCM. It's latest version. It will work with outlook 2013. Which version of Office do you have? Don't know if you have received my previous messages (they are disappearing from the chain). When I install, the process goes smoothly and asks to reboot the laptop. After the restart, the first screen of the installation process automatically pops up - BCM is not installed. I have run this process several times to no avail. I'm using Windows 10, Office Professional Plus 2013, version 15.0.4787.1002. Where can I download this Nov 14 version? I do have the other messages - they go into the moderation queue after posting. Thanks Diane. I tried that one again with the same result. Found a solution...turns out that I needed to do a Clean boot (https://support.microsoft.com/kb/929135) to install BCM. Are you sure onenote was the culprit? When clean boot helps, it's usually antivirus that is at fault, especially when its a 3rd party AV. Well even with the end. Diane thank you sooooooo much for all your work. I don't think we would have BCM up and running without you. It's all in sql, so you can export to csv if you install the SQL Management studio. So far, no really good replacements for it - there are a lot of options (at varying price points) and it really depends on what features you need. Most do not integrate with outlook and are online/cloud based. Since I primarily use BCM to maintain a history of all communications / meetings I realize that I can most likely accomplish this through a series of rules. What I cannot figure out is how I can access the 12 years of communication history that currently resides in BCM when I finally update to Outlook 2016. You'll need to export it - although, you might be able to access it using Access as a front end. The big thing with using access is writing the sql to load the records so they make sense. My name is Ashish and I am Technical Lead with Microsoft Outlook team. To be very precise on our discussion, Outlook 2016 is not going to support Business Contact Manager and there are no plans to make any changes to make BCM compatible. So the only option left is to migrate to Microsoft Dynamics CRM or not to upgrade to Office 2016.